Celebrate your wedding day in style! Your wedding day is truly one of the most memorable days of your life, so it's important to both look and feel beautiful! Razzmatazz will help you choose and coordinate the services that best fit your individual needs. We want you to relax and enjoy while we handle all of the details. Call our wedding coordinator to reserve your bridal package or to customize a package and receive an estimate for you and your bridal party. We look forward to assisting you throughout the planning stages as well as on your special day. -Includes false eyelash application, if desired. - A 20% gratuity is added to the total of the service price. - On location services are available for an additional fee. A non-refundable deposit of $100 on the day of your trial is required. A non-refundable deposit of $150 on the day of your trial is required. 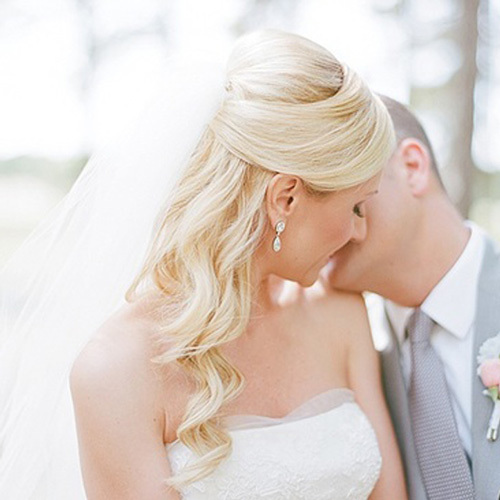 Our amazingly talented team can design the hairstyle of your dreams for your big day. Take a look below for some of the masterpieces we've created. Contact us if you want to chat about your vision.